A Boeing 737 airliner with more than 110 passengers and crew crashed Friday near Jose Marti International Airport in Havana, Cuba, shortly after takeoff. 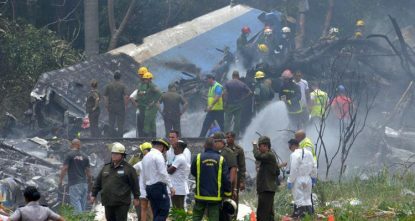 The plane, Cubana Flight 972, was on its way to Holguin, Cuba, when it went down about 12 p.m. local time. Recent reports state at least 100 people on board were killed and three people survived the crash in critical condition. Church of the Nazarene Mesoamerica Region Director Carlos Saenz confirmed there were several Nazarene pastor couples among the passengers on board. The couples were returning home to the church’s Cuba East District from a minister and spouses’ retreat. Cuba Church of the Nazarene President Leonel López reports 10 Nazarene couples were confirmed to be among those who lost their lives. The names of the lost were released Sunday. López said the retreat was a 3-day event was attended by 125 couples. According to López, the bus driver said the East District couples who were one Flight 972 were singing and praying on the bus on the way to the airport. “May all the Church of the Nazarene family unite in prayer on behalf of our brothers and sisters,” Saenz said. López said several children, adolescents, and young are left orphans without their fathers and mothers. Some of them have no extended family. Prayer is requested for all affected by this tragedy. For more updates, and for information on how you can respond to this tragedy, please visit NCN news.